I’m getting ready to head to New York for the Kelly Confidential Ovarian Cancer Research Fund Event. Attempting to travel light, I'm leaving the Mactop at home. So this post will be it for next week unless I really get my act together. I feel so grateful. I get to meet Ryan (the girl) from Foodbuzz, Jennifer from Electrolux, and fourteen amazing food blogging women on this trip. Afterwards, my dear friend Kathia is picking me up to explore the city, and Chef Elizabeth is meeting us for dinner. Even Christine is stopping by the next day for breakfast. Food blogging friends are the best! I've never felt so welcome. There is however one new friend I wish I could take with me. The fun, hilarious, life and wine loving Sandhy Robinson-Jones, better known as L'Optimiste. Sandy was diagnosed with stage 3b Ovarian Cancer in February 2008 at the age of 46. She’s completed six cycles of chemotherapy and had a total hysterectomy and oopherectomy. I can't even imagine one cycle of chemo, let alone six! Sandhy, since I can’t pack you in my suitcase, I’m tucking you into my heart and carrying you with me. The first toast of the evening will be to you, your incredible spirit, and good wine! Oh yeah, and I'm only taking my point and shoot, but before you chew me out let me tell you why. First, good pictures come from the photographer, not just the camera. (My old photography professor enjoyed beating this into my thick young head for years.) Second, I get more candid photographs with my point and shoot. A small camera doesn't scare people like a big one does, and often I can shoot unnoticed. And third, I don't want to haul the big gun around a snowing city when I don't need to. It'll be warm and safe at home when I'm wet and cold. With a decent point and shoot it is possible to get great shots. Really! You believe me, don't you? Since I’ll be in the birthplace of American pizza, I thought it would be tonight’s recipe. I know New York represents every cuisine in existence and not just pizza, but it’s Saturday, I’m still in Idaho, and I was craving pizza. Well, I'm out of here. See you in a week! 1. Make the pizza dough about an hour and a half in advance. 3. When ready to assemble, place a pizza stone in the lower third of the oven and preheat to 500 degrees. Or place the pizza stone on the grill and turn to high heat. 4. Place the bruschetta in a food processor and pulse to lightly chop into a chunky sauce. 5. Divide the dough in half and roll out each piece pretty thin pieces about the size and shape of your pizza stone. Place the doughs on parchment paper cut to size. 6. Brush the dough with olive oil. Top the dough with the bruschetta sauce. Then top with a little mozzarella, then spinach, onion slivers, shaved Parmesan, and a sprinkle of salt and pepper to taste. 7. Oven Method: Use a pizza peel or cookie sheet and slide under the parchment. Slide the parchment with the pizza onto the pizza stone. Bake one pizza at a time for anywhere from 5 to 10 minutes or until golden brown. Watch it carefully, it can quickly turn from beautiful to burnt. Grill Method: Use a pizza peel or cookie sheet and slide under the parchment. Slide the parchment with the pizza onto the pizza stone. Close the lid and turn the heat to medium/medium high. Bake one pizza at a time for anywhere from 3 to 6 minutes or until golden brown. Watch it carefully, it can quickly turn from beautiful to burnt. 8. Repeat with second pizza. A lovely recipe - thanks for sharing! Laura~Your friend is in my prayers. The pizza looks awesome. It is 1 am and I'm now hungry!! You have a safe trip and a glass of wine for me ;). I wish I had some of this right now, looks delicious! And have fun you jetsetter!! Have a great time in on your trip. What a dear friend you are- best wishes to Sandhy. Lovely pizza, it looks almost too good to eat. Amo la pizza!! la tua è super buonissima!! Have a wonderful trip. We missed the big brunt of snow with only a couple of inches, so you'll not have to muck around in the dirty snow. Enjoy the big apple - one of the best places on earth! PS - If you see the Queensboro Bridge (aka the 59th street bridge), think of me. This is where I spent my childhood. First - YES I AM GREEN!! with envy! [sort of spinach coloured...] whoo hoo - I've been supporting the Kelly Confidential site for an age...never did get a fridge, but we all had cupcakes galore on our facebook pages. Surely you'll meet Kelly Ripa?? How fun, I can't wait to see the pics. Second: thank you. So sweet of you to do mention me in this post! Enjoy the toast - and here's to you and your wonderful blog! Bon voyage chéri! Hope you have a wonderful trip! We will be awaiting all the fabulous inspiration you will be receiving from all the great food you'll be endulging in while in NY. Oh, and this pizza looks wonderful!!! Your pizza looks amazing! Can't wait to see you in the big apple! Fantastic Pizza...have a fun trip, Laura !!! The pizza looks simple and so delicious! Enjoy your stay in NYC! Can't wait to hear all about your trip when you get back! I'm so excited for you!! You go girl! This is so lovely! Thanks for sharing this. Your pizza looks delicious - I like to add a little whole wheat into my dough too. Have a wonderful and safe trip! Sounds like an amazing trip - hope you'll tell us all about it when you get back. Left something for you on my blog - stop by and pick it up when you get a minute! Yes Sandhy, I think we get to meet Kelly Ripa. Although I don't think of it as meeting, more like getting instructions. To me meeting is when I make a new friend. I'm thinking she probably won't want to go for coffee after lol. Have a fabulous time at the event, and with all the blogging friends! Really wish I could go too! Best wishes for the trip Laura, looking forward to stories when you get back! Yummy pizza btw. I'm a griller so your pizza recipe will me going on my Traeger grill! LOVE this recipe. I have yet to make my own crust but fresh pizza with spinach and shaved parm you just can't go wrong. Have tons of fun and I can't wait to see your photos and hear all about it! Love this pizza! Looks great! how simple everyday ingredients can transform into something culinary! great idea:) these look awesome! and they'd be perfect for my Valentine day giveaway! would you care to send them in for the event? Of course the pizza looks great. Can't wait to hear of your adventures in NYC. It was so nice to meet you this week!!!! This pizza looks delicious. Hope you're having a safe trip! Your pizza looks delicious--I love them simple. I just did a pizza post too--must be something in the air! Love the pizza, Laura. I have been thinking about you in this nasty snowstorm. I guess you'll have even more stories to bring back to us! This looks amazing! Have fun in NY! I hope you can make it there with all this snow! Have a great time! Stay warm. 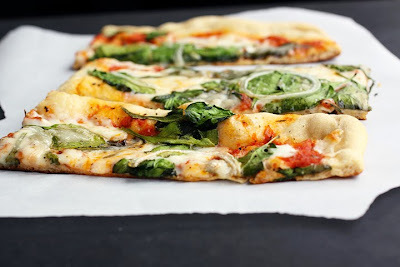 Laura, this sounds so yummy...even though my 4 year old will beg me to make "regular pizza." I'll definitely be trying this one. You little turkey--have you stopped posting to myspace? I haven't got any updates in a while so I stopped by your real blog and was glad to see a few new ones I'd missed. You must be super busy with this travelling--sounds like you're having a blast too! Enjoy your time at the OCR event! That bruschetta is GORGEOUS!!! Oh my! Why snow, why? Next time I am in your neck of the woods!